NOTE: I have totally rewritten this post as the original solution was crap. This one works! I’ve been having an issue with the Windows key being “stuck.” It’s as if the key is being constantly pressed and before you ask, it is not a physical keyboard problem. The problem stems from Windows itself as I will show below. An Internet search will lead you to several common solution suggestions. The most common ones are trying a new keyboard or blaming it on Windows Sticky Keys feature. Neither of these are the culprit, but go ahead and try. Even in Safe Mode, the key seems to be stuck! The sledgehammer approach is to edit the registry and disable the Windows key altogether. The problem with executing this solution is that it’s very difficult to do when every time you type something it’s executing Windows+ shortcuts. If you go this route, you will need to figure out a way that involves only mouse clicks. Microsoft has a page with downloadable files that will edit the registry to disable the Windows keys. So, a couple ideas come to mind: you could bookmark the page in Chrome on an iPad or another machine and wait for it to sync with your desktop or maybe use Dropbox or a USB drive to transfer a URL shortcut file to the affected machine. Once you get the Windows key unstuck, I HIGHLY recommend that you disable the Windows key! (See above) If not, you should at least save Microsoft’s disable Windows key page to your favorites. Once you get the key unstuck, it will function normally. That means it is not a physical keyboard nor a Sticky Keys issue. Also, since the problem happens on various PC makes and models, you have to point the finger at Windows itself. Also, I find it very odd that Microsoft even has a page devoted to disabling the Windows key. 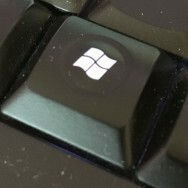 Since no other key works qutie like the Windows key, perhaps there is something inherently problematic with the implementation and they couldn’t get to to work properly across all hardware systems. I don’t know, but the truth is I rarely used the key and definitely can live without it. One of the things I tried when I was looking for a solution is to bring up the Windows virtual keyboard. I then noticed that it was the left Windows key that was highlighted (indicating it was stuck), not the right. Since my keyboard only has a left Windows key, I remapped the Left Windows key to a Right Windows key using KeyTweak. We shall see if this solves the problem should it occur again, but if it does, I will disable both left and right Windows keys. I hope this post helped you. Good luck! 2016-08-20: For an unrelated reason I had to reinstall Windows. The Windows key is no longer stuck and I can use it. Obviously, the problem is software not hardware. Absolutely no idea why this fixed it but I downloaded key tweaks to reroute my windows key but right after downloading it it fixed itself… does downloading something fix it? This problem happens to me occasionally after using a remote desktop application. The solution is to press the windows key twice. All works well – until the next time it happens. Try changing the keyboard language. Had the same problem but it was the CTRL or ALT keys for me. Changed the keyboard language from Canadian to US and the problem went away.